In fact, we have the most generous referral program that we know of among any staffing or consulting firm. Are you getting free coffee or a pat on the back for referrals when you deserve to be making car payments? We pay 10% of net profits for up to 5 years! See conditions below. It is simple. Simply be the first to refer an opportunity. If SDS wins new business, you get paid 10% of profits as we accrue it at a new client for the next five years! We send you a prepaid credit card and refill it as the profits roll in. To get started review and sign the SDS Referral Fee Agreement. Once complete, email to leads@sdselite.com. Referrals should be for the end-client not third parties. We are interested in custom software development, web, mobile, and desktop development, data, reports, and IT Staffing or Consulting. See example scenarios below. AwesomeCorp needs 3 .NET developers and you introduce us to the hiring manager who signs three one year contracts. We earn a net profit of $5 per hour for twelve months. After vacation and holidays, a total of 6000 hours are billed at a profit of $30,000. You just earned yourself $3000. That coffee card the recruiter gave you for a referral doesn’t seem so nice does it? The following year, AwesomeCorp extends 1 developer another 12 months. You earn the full referral fee because we consider an extension the same opportunity. That’s another $1000 year two! But wait, AwesomeCorp now wants SDS to do custom application development for an opportunity you did not refer to us. We complete the project and earn another $10k net profit. You just earned 5% for that referral a year ago and raked in another $500. You will continue earning for five years after the referral agreement was dated. GrandeCorp is an existing client, but it is a large company and we are unable to know of every opportunity that they have. Lucky for us, you know a project manager who is looking to build a software development team and isn’t sure who to call in the Tampa area. You are the first to refer us, and we create a perfect solution earning $10,000 in net profit. You earn 5% or $500! Referral fees may be against corporate policy and perhaps even illegal depending on the situation. We are unable to compensate you personally with anything that is not edible and I’m told money is not considered edible. When you refer opportunities to SDS for your own company it reduces our costs because we don’t need to spend time and resources hunting for them. Because of that, SDS has corporate-friendly and legal-friendly incentives to choose from of a charitable donation or a credit that may be later applied towards future business with your company. The bottom line is that we want to compete for your business, but we also must operate in a way this is both ethical and legal. 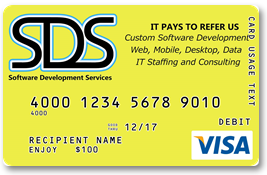 The full terms and conditions are in this agreement: SDS Referral Fee Agreement. The signed agreement supersedes all else. The Referrer’s fee shall be calculated as 5% of the net profit of the services sold by Seller as a direct result of an introduction at a current SDS customer for a previously unknown opportunity. The Referrer’s fee shall be calculated as 10% of the net profit of the services sold by Seller as a direct result of an introduction to a new SDS customer for a previously unknown opportunity, and 5% of net profits for all additional opportunities at the new client for a period of 5 years. Referrer’s fees shall not be combined with any other fee, and total Referrer’s fees shall not exceed 10% of net profits. Referrer’s fees shall be due net thirty (30) days from the date that a profit is accrued.